On top of Saudi-Houthi War, South Yemen yearns to Secede! While UN-brokered peace talks between Houthi rebels and Yemen’s Saudi-backed government-in-exile struggle to reach a political resolution to end a 15-month-long war, a rift between Yemen’s North and South is deepening, with the vast majority of the country’s six million Southerners demanding full secession. Heading the independence initiative is Al-Hirak, a deeply divided yet widely popular group that has gained support among Southerners by calling on a deep-seated resentment of the North. 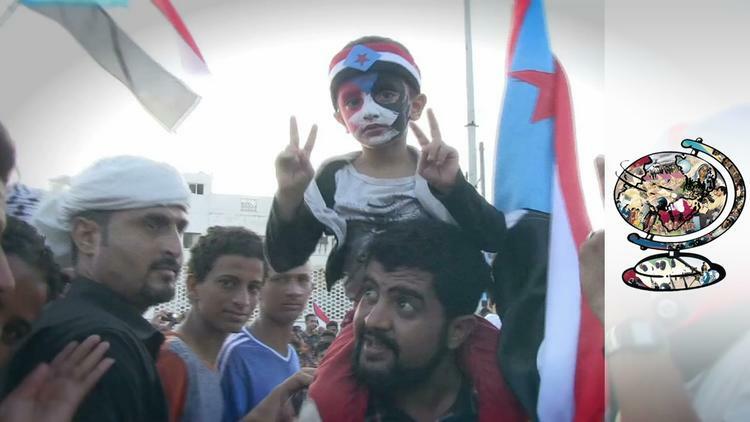 Hirak was first formed as a peaceful protest movement in 2007 by southern military and political elites embittered by exclusionary northern policies that were instituted after Yemen’s unification in 1990. Formerly a sovereign country, South Yemen, known as the People’s Democratic Republic of Yemen, was established following Britain’s withdrawal from Aden in 1967 and extended from the southwestern tip of the Arabian Peninsula to the eastern border with Oman. It was the only communist country to ever exist in the Arab world. Unification between Yemen’s North and South was marred by a civil war four years later—a brief and decisive conflict that consolidated the North’s dominance over greater Yemen. Objection to the government’s treatment of the South soon followed along with demands for reparations, equal rights and, eventually, secession. Hirak now encompasses an array of overlapping factions, each with its own political, religious, and ideological leanings. Some support a two-region federal system as a path towards independence, while others call for immediate secession. Tribal or Islamist leanings influence a few factions, while others come from socialist and ex-military backgrounds. Some groups advocate for peaceful demonstrations to achieve their goals, but the last few years have seen a rise in armed militias as well, such as the sizeable Southern Resistance that helped expel the Houthis from the South last July. The uniting force among these factions is a pining for the perceived glory days of an independent South and a collective narrative of poor governance by the North—a view that has only been confirmed by the failure of a post-2011 political transition and a subsequent war that many Southerners see as a northern conflict spilling into their territory. According to most analysts, independence is not likely in South Yemen’s future, partly because of a lack of unity among secessionists and the absence of foreign support for a divided Yemen. Nonetheless, the growing call for independence combined with the presence of pro-secessionist armed militias threatens to destabilize Yemen even after a political resolution is reached by parties to the ongoing peace talks. “The South is incredibly important and if the government ignores southern grievances and demands for the fifth time in a row, then it’s really building up that powder keg and pushing Yemen down the road to yet another civil war,” says Peter Salisbury, a Yemen analyst and associate fellow at Chatham House’s Middle East and North Africa Programme. Southerners lament a persistent lack of basic government services such as the provision of water, electricity, and infrastructure. As a result of the conflict, southern cities are suffering from prolonged power cuts that have severely impacted the water supply and factories. Hospitals, which need power not only to run life-saving equipment, but also to ensure the supply of oxygen tanks, have reported a number of deaths due to lack of electricity. These grievances, which are not unlike those of the Houthis prior to their armed rebellion and takeover of San’a, have largely been ignored throughout the 26 years of Yemen’s unity. Historic underrepresentation in national institutions and negotiations (including the ongoing Kuwait talks) is another sticking point that is seen to confirm the central government’s disregard for the South. Created as a forum to solve Yemen’s post-revolution political problems, a 2013-14 National Dialogue Conference aimed to form a new constitution and forge a path toward a representative government. The conference was boycotted by Hirak leaders who demanded recognition of the South’s right to self-determination and independence. One of the conference’s main shortcomings was its inability to resolve the southern issue and the consequences of this failure can be seen today. Among the many dire repercussions of the ensuing conflict was the creation of a safe space in the South for the Islamic State and Al-Qaeda in the Arabian Peninsula, which was established in Yemen in 2009 and is considered the group’s most dangerous branch worldwide. Terrorist attacks are now commonplace in southern cities and normally target police and military personnel, with upwards of 45 army recruits killed in a bombing on May 23 in Aden, the former capital of South Yemen and the current temporary capital of President Abed Rabbo Mansour Hadi’s government. Both in an effort to defeat extremist groups and to demonstrate an ability to secure their own territory, pro-secessionist personnel have worked to expel Al-Qaeda from their strongholds, including the militants’ once-lucrative mini-state in the southern port city of Mukalla. Tasked with securing Aden are two prominent secessionist leaders–Aidrus Al-Zubaydi and Shalal Ali Shayae. The duo was appointed by Hadi in December as governor and head of security after they proved their worth by expelling from Aden forces loyal to former president Ali Abdullah Saleh and the Houthis. The security vacuum resulting from the civil war has allowed southern forces to display some level of independence and act on their hostility towards Northerners, whom many locals see as occupiers. Headed by ardent secessionist Shayae, Aden’s security personnel have been acting outside of Hadi’s purview by arbitrarily arresting and deporting northerners. On May 8, pro-secessionist forces raided restaurants and homes in Aden, rounding up over 800 allegedly undocumented northern workers and loading them onto trucks to be shipped back across the historic border. This act of deporting Yemeni citizens within their own country was denounced both by President Hadi and Prime Minister Ahmed bin Dagher, but was justified by Aden’s security council as a standard legal procedure, illustrating the degree of autonomy which southern forces are now able to exercise. On May 14, southern authorities in Aden province banned the sale of qat, a mild stimulant consumed daily by a large portion of Yemenis. A statement issued by Aden’s security council cites the drug’s negative impact on health and security as the reason for the ban. The move, which follows similar initiatives in southern Yemen’s Soqotra and Mukalla, is also an effort to distinguish a refined south from an uncivilized north. Although qat is used across the country, many Southerners are taking part in campaigns to eliminate the habit of chewing qat, a practice often associated with the tribal north. Qat had, in fact, been banned in South Yemen during the days of independence and only upon unification in 1990 was the drug legalized again across the country. For those traveling to or across Yemen, the North and South are effectively divided. According to journalist Iona Craig, the country is split between two governments. Visas to the southern city of Aden are issued through Yemen’s foreign embassies. Visas to the North, including the capital San’a, must be obtained separately through the ministry of information or the ministry of foreign affairs. Similar demonstrations of sovereignty are expected for the remainder of the war and the continuation of Yemen’s conflict, which is still far from a resolution after two months of peace talks, is fanning the flames of secession. An inclusive political process and future government—in other words, a rejection of the former northern elitist structures imposed by Saleh and Hadi—appears to be the only hope of curbing post-war hostilities and possible violent clashes. If this can be achieved, it will be the first step in proving to the South that a unified Yemen is indeed in their best interest. Hannah Porter is a free-lance journalist based in the Middle East. Her work has appeared in al-Ahram and Middle East Eye.